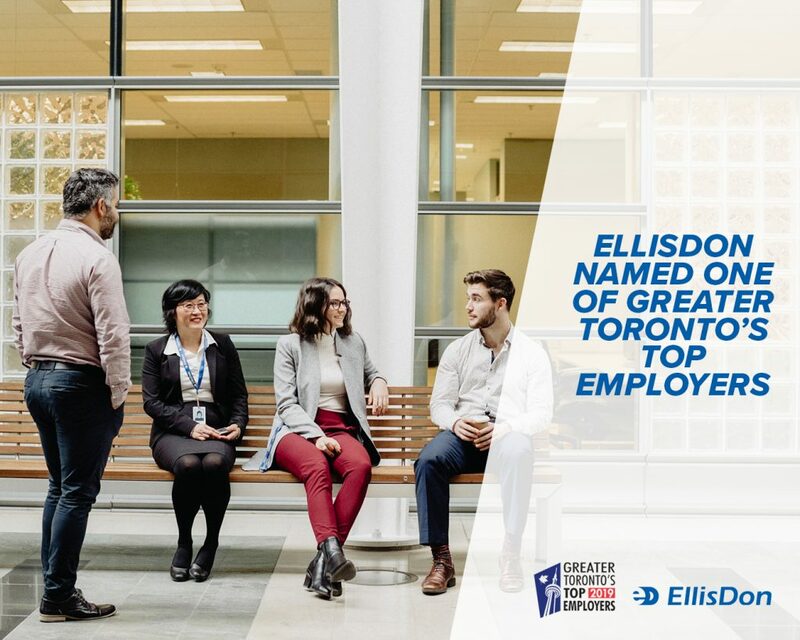 Today, EllisDon was named as one of the recipients on the 13th annual list of Greater Toronto’s Top Employers. Employers throughout the Greater Toronto Area were evaluated by the editors of Canada’s Top 100 Employers to determine which of them within the GTA are leading their industries in offering exceptional workplaces for their employees. This year the top organizations were recognized for attracting talent outside of their industries, particularly focused in technology, while offering a mixture of traditional benefits and flexible options that cater to different individuals. The Greater Toronto’s Top Employers competition is an editorial project that recognizes employers with exceptional human resources programs and forward-thinking workplace policies. Editors at Mediacorp grade employers on eight criteria, which have remained consistent since the project’s inception: (1) Physical Workplace; (2) Work Atmosphere & Social; (3) Health, Financial & Family Benefits; (4) Vacation & Time-Off; (5) Employee Communications; (6) Performance Management; (7) Training & Skills Development; and (8) Community Involvement. Mediacorp Canada Inc. is the nation’s largest publisher of employment periodicals and has managed the Canada’s Top 100 Employers project since 1999. It includes 19 regional and special-interest editorial competitions that reach over 13 million Canadians annually through various newspaper partners, including The Globe and Mail; and operates Eluta.ca, the largest Canadian job search engine.